It’s just non-stop, silly, entertaining fun that you don’t want to miss! It is 932 A.D. in England, and King Arthur, joined by his servant Patsy, is “riding” through the land trying to find men to join his Round Table. Arthur is frustrated by several failed recruitment attempts, including one with an awfully resilient Black Knight, but his luck might not stay bad for long. In a near village, Sir Robin the NotQuite-So-Brave-as-Sir-Lancelot and Sir Lancelot the Brave decide to enlist in the army, because unlike some other villagers, they are not yet dead (Monk’s Chant/He’s Not Yet Dead). Meanwhile, Arthur continues to look for able-bodied men, and soon finds Dennis Galahad and his mother, both of whom are politically active peasants that doubt Arthur is really a king. Directed by Dave Dagenais, our production features LST favorites: Jeff Spencer, Susan Boyle, Donovan Chambers, Brian Dettman, James Porras, and Monica Nordeen in leading roles as well as some amazing new talent! Sir Robin and his minstrels follow King Arthur and Patsy into a "dark and very expensive forest", where they are separated. King Arthur meets the terrifying but sillyKnights who say Ni, who demand a shrubbery. King Arthur despairs of finding one, but Patsy cheers him up ("Always Look On The Bright Side Of Life") and they find a shrubbery shortly after. King Arthur begins to give up hope of ever putting on the Broadway musical and laments that he is alone, even though Patsy has been with him the entire time ("I'm All Alone"). The Lady Of The Lake appears and tells Arthur that he and the Knights have been in a Broadway musical all along Reunited with his Knights, Arthur meets Tim the Enchanter who warns them of the danger of an evil rabbit. When the rabbit bites a knight's head off, Arthur uses the Holy Hand Grenade of Antioch against it, knocking down a nearby hill and revealing that the "evil rabbit" was actually a puppet controlled by a surprised puppeteer. A large stone block showing a combination of letters and numbers is also revealed. the legend of King Arthur and his Knights of the Round Table. 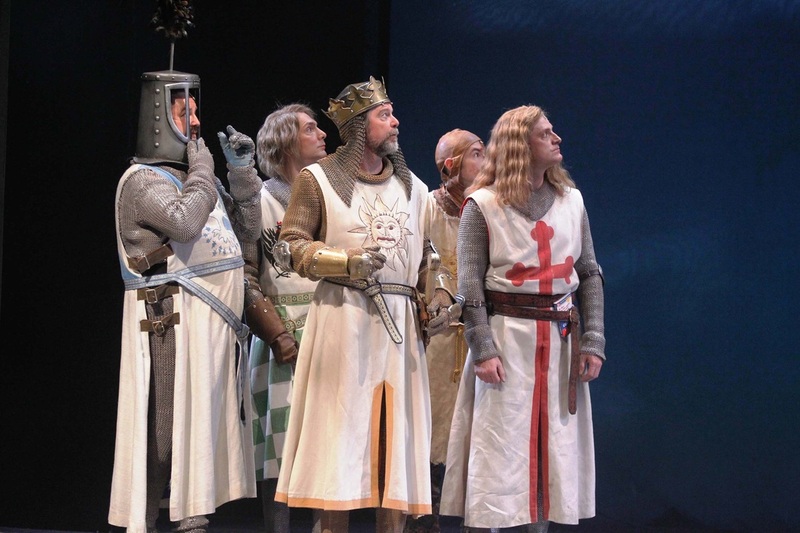 This comedic musical has won many awards and is a favorite for those who love Monty Python. If you haven’t seen any Monty Python don’t be afraid, you will soon come to love it for the off the wall comedic singing and dancing. The show follows King Arthur as he assembles a motley group of men to become Knights of the Round Table. The show kicks off with frolicking Finnish villagers singing the "Fisch Schlapping Song." It’s got great musical numbers, great characters and jokes, and amazing choreography by Jill Grundstrom including some fun tap numbers!